Create a large wedding album or share your favourite family moments with a customised photo book from bonusprint. With our large photo albums, you can bring your best memories back to life and make something unique to you. Here’s how to order online. Don’t leave your favourite memories sitting on your laptop or smartphone. With a large photo book from bonusprint, you can easily flip through photos with friends and family. You can share stunning wedding shots or create a large baby photo album to look back on those adorable early memories. And with our easy-to-use creator tool, you can personalise it any way you like. Just choose from our landscape, portrait or square photo books, then have some fun customising your big, beautiful photo album with the pictures you love. In our creator tool, you’ll see a selection of photo book sizes, ranging from small photo books to extra-large albums. Filter the results by large photo books then you can choose your format. If you’re looking for an A4 photo album for your family photos, our large portrait books are close in size – these measure 21 x 28 cm. 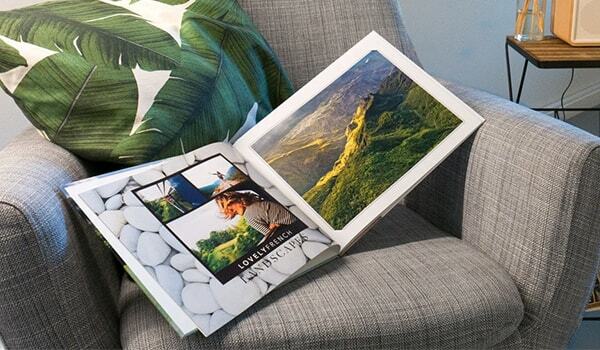 Our large landscape album, which is 28 x 21 cm, is also a great alternative to an A4 photo book for your travel snaps. When you’ve found the right format, start uploading your photos and get experimenting with our editing tools. No matter what size album you choose, whether it’s a medium photo book or a large, there are loads of finishing touches you can add. You can make your big photo book even more unique with a photo cover. If you want to make a series of large family photo albums for your bookshelf, you can create matching linen books or large faux leather photo albums in hardback. And to give your images a better colour contrast, you can select gloss paper too. When you’ve added all the extras you want, you’re ready to order your large photo album.